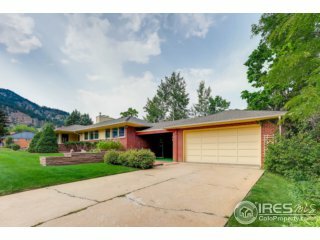 1st Time Offered For Sale & Rare Opportunity in one of Boulder’s Coveted Premier Neighborhoods in Upper Chautauqua w/ Stunning Flatiron VIEWS! This well maintained ranch-style home has a full, finished garden/level basement and sits on a 9668 sqft CORNER Lot that offers Huge Potential and is just a short walk to incredible trails. Build your dream home or remodel/update and make this special lot/location HOME! 2-car detached garage and beautiful landscaping.